K. pneumoniae is a Gram-negative opportunistic pathogen associated with hospital-acquired infections such as pneumonia, urinary tract infections, septicemia and meningitis. Infection with multidrug-resistant K. pneumoniae isolates is a growing clinical problem . Carbapenems are broad spectrum antibacterial agents that are kept as the last treatment option for infections caused by multi-drug resistant K. pneumoniae isolates . However, uncontrolled administration of carbapenems leads to the development and the spread of carbapenem resistant isolates  which are usually resistant to other antibacterial agents such as fluoroquinolones , and these isolates have limited treatment options leading to significantly high morbidity and mortality rates . Carbapenem resistance in Enterobacteriaceae has been developed due to the acquisition of genes encoding carbapenemases (carbapenem hydrolyzing enzymes) . Three classes of carbapenemases (A, B and D) are involved in the carbapenem resistance i) class A (K. pneumoniae carbapenemase) [3, 4, 6, 7] ii) class B, metallo-β-lactamases (MBLs) such as Verona integron metallo-beta-lactamase (VIM), Imipenemase metallo-beta-lactamase (IMP) and New Delhi metallo-beta-lactamase (NDM) [5, 8] and iii) class D, oxacillin hydrolyzing beta-lactamases (OXA) [9, 10]. The carbapenem hydrolyzing genes are commonly encoded on mobile genetic elements and are accompanied by other antibiotic resistant genes resulting in cotransfer of the antimicrobial resistance genes and rapid spread of bacterial infections . Furthermore, mutations in the bacterial outer membrane proteins contribute to the microbial resistance to carbapenems. For example, the loss of porins, OmpK35 and OmpK36, is associated with reduced susceptibility of K. pneumoniae to carbapenems and cephalosporins [11-14]. Treatment of life threatening infections with imipenem/meropenem can favor the development of resistance to carbapenem antibiotics. Recently, carbapenem-resistant K. pneumoniae strains emerged in Egyptian hospitals. In order to control the spread and dissemination of carbapenem-resistant K. pneumoniae, various mechanisms mediating the resistance of these isolates need to be investigated. In this research, different mechanisms behind the emergence of K. pneumoniae isolates with elevated resistance to carbapenems were clarified. K. pneumoniae isolates were purified from urine and sputum samples in the period from January 2015 to June 2015 from Mansoura University hospitals according to the Helsinki declaration for medical research in handling, use and care of human subjects. K. pneumoniae isolates were identified in accordance with the biochemical standard assay methods . The carbapenem susceptible K. pneumoniae ATCC 33495 was used as a control. The susceptibility of all purified K. pneumoniae isolates to different carbapenems including imipenem (IPM, 10 µg), meropenem (MEM, 10 µg), doripenem (DOR, 10 µg) and ertapenem (ETP, 10 µg) was evaluated by the disc-diffusion method . K. pneumoniae isolates with intermediate susceptibility to carbapenems and carbapenem resistant isolates were selected. Phenotypic and genotypic characterization of the carbapenem resistant isolates was conducted. The selected carbapenem-resistant isolates were tested for susceptibility to other antimicrobial agents: (Table 2). The minimum inhibitory concentrations for the carbapenem-resistant isolates against imipenem and meropenem were evaluated by broth microdilution method using 96-well microtiter plate according to the Clinical Laboratory Standards Institute (CLSI), 2015 . The ability of K. pneumoniae isolates to release carbapenemases was estimated by Modified Hodge test (MHT) as recommended by CLSI, 2015 . Total DNA was extracted from the carbapenem-resistant K. pneumoniae isolates using Genomic DNA purification Kit (Thermo Fisher Scientific, European Union). The extracted DNA was used in real time PCR and in random amplified polymorphic DNA (RAPD). The presence of genes coding for carbapenemases such as blaVIM-1, blaNDM-1, blaIMP, blaKPC and blaOXA-48 was detected by polymerase chain reaction using fermentas Dream TaqTM Green PCR Master Mix and specific primer pairs (Table 1) [6, 8, 9]. The copy numbers of the detected genes blaVIM-1, blaNDM-1 and blaOXA-48 were quantified by real-time polymerase chain reaction using FIREPol® EvaGreen®qPCR Kit (Solis Bio-Dyne, Estonia). PCR consisted of 200 ng DNA, 1 μl of the forward primer (2 µM), 1 μl of the reverse primer (2 µM) (Table 1), 4 μl of 5 × EvaGreen®qPCR master mix, and RNase-free water to a final volume of 20 μl. In addition, a negative control reaction lacking DNA template was performed. The quantitative PCR was processed in the Rotor-Gene Q thermocycler (QIAGEN, Germany) as indicated: one cycle at 95 °C for 15 min, then 40 repeated cycles of 15 seconds denaturation at 95 °C for, 30 seconds annealing at 55 °C with blaOXA-48 or 52 °C with blaVIM-1 and blaNDM-1 and 1 min extension at 72 °C. The copy numbers of the carbapenemase genes (blaNDM-1,blaOXA-48,blaVIM-1) were measured relative to an internal K. pneumoniae housekeeping gene rpoD. Standard curves were generated for both the target genes (blaNDM-1,blaOXA-48 and blaVIM-1) and the endogenous control (rpoD) using 10-fold dilutions of the template DNA at known concentrations. In the standard curve, the logarithm of initial quantity of template was plotted against the CT values and gene copy numbers were calculated using the standard curves. The ratio of the target gene copy number to the reference gene copy number was calculated in order to determine the relative quantity of each gene [17, 18]. Table 1. Primer pairs used in PCR and RT-PCR of carbapenemases. The outer-membrane proteins of the carbapenem-resistant isolates were analyzed by SDS-PAGE  and compared to standard K. pneumoniae ATCC 33495. Briefly, the isolates were grown in nutrient broth, the cell pellets were sonicated and the cell debris was discarded. The supernatants were ultracentrifuged at 100.000 ×g for one hour. The pellets were incubated with N-lauroylsarcosine (1 %) at 37 °C for 30 min. Again the outer membrane proteins were collected by ultracentrifugation at 100.000 × g for one hour. Samples were boiled in Laemmli's sample buffer. SDS-PAGE was performed with a 10 % acrylamide gel at 80 V for 3 hours and stained with Coomassie blue. Molecular typing of the isolates was carried by random amplified polymorphic DNA (RAPD) using oligonucleotides Operon 18; 5'CAGCACCCAC3' . PCR mixture was composed of the genomic DNA (100 ng), Operon 18 primer (20 μM), 1 μl dNTP (250 μM each), 5× Flexi buffer GoTaq®, 1 μl MgCl2 (25mM), 1.5 U DNA polymerase FlexiTaq (Promega, USA) and H2O up to a final volume of 20 μl. The amplified amplicons were separated by electrophoresis on 1% w/v agarose gels at 80 V for 2 hours. The RAPD profile of the carbapenem-resistant isolates was scored as a binary code and analyzed using DendroUPGMA. In this study, eighty K. pneumoniae isolates were purified from urine (n=50) and sputum (n=30). Urine samples were collected from Kidney Hospital and Digestive System Center, and early morning sputum samples were collected from Oncology Hospital, Emergency Hospital, and Children Hospital. Eight isolates were resistant to doripenem and imipenem and seven isolates were resistant to ertapenem and meropenem. Table (2) demonstrates the epidemiological sources of the carbapenem resistant isolates along with the antimicrobial susceptibility profile against different antimicrobials. Four isolates were obtained from urine samples and four isolates were purified from early morning sputum. Antimicrobial susceptibility profiles of the carbapenem-resistant isolates against different antimicrobials agent are indicated in Table (2). The imipenem and doripenem non-susceptible isolates exhibited coresistant to other β-lactams; ampicillin/sulbactam, amoxicillin/clavulanic acid, ceftazidime, cefuroxime, ceftriaxone and cefotaxime. Also, seven of the aforementioned isolates were resistant to tobramycin and piperacillin/tazobactam. Furthermore, six isolates were resistant to cefoxitin, cefepime, gentamicin and ciprofloxacin. On contrast, most of the isolates retained susceptibility to trimethoprim-sulfamethoxazole (n=4), levofloxacin (n=6) and amikacin (n=6). Table 2. Susceptibility of the carbapenem resistant isolates to various antimicrobial agents. AMC: amoxicillin/clavulanic acid, SAM: ampicillin/sulbactam, FOX: cefoxitin, CXM: cefuroxime, CTX: cefotaxime, CRO: ceftriaxone, CAZ: ceftazidime, TZP: piperacillin-tazobactam, FEP: cefepime, CN: gentamicin, TOB: tobramycin, AK: amikacin, SXT: trimethoprim-sulfamethoxazole, CIP: ciprofloxacin, LEV: levofloxacin, IPM: imipenem, MEM: meropenem, DOR: doripenem, ETP: ertapenem. Table (3) shows the minimum inhibitory concentrations for the carbapenem-resistant isolates against imipenem and meropenem. All the resistant isolates had high MICs (≥16 µg/ml) except isolates K18 and K70 had MICs from 4-8 µg/ml. The carbapenem-resistant isolates developed a distorted or a cloverleaf shaped inhibition zone in the MHT as a positive indication of carbapenemases. In addition, PCR showed that five isolates (K18, K23, K40, K70 and 74) harbored blaNDM-1 gene, four isolates harbored blaVIM-1 gene (K11, K23, K35 and K60), K23 had both blaNDM-1 and blaVIM-1 genes and K60 carried dual resistance genes blaVIM-1 and blaOXA-48 genes. PCR also showed that all the carbapenem-resistant isolates lacked blaKPC and blaIMP carbapenemases. The replicates of carbapenemase encoding genes were detected by RT-PCR. Isolates K23, K40 and K74 had high copies of blaNDM-1. Also, multi-copies of blaVIM-1 were detected in isolates K11, K35 and K60. Meanwhile, isolate K60 recorded a high copy number for blaOXA-48. In contrast, isolates K18 and K70 had low copy numbers of blaNDM-1 (Table 3 ). Table 3. Characteristics of the carbapenem resistant isolates. IPM; imipenem, MEM: meropenem, ND: non-detectable, MIC: minimal inhibitory concentration. Data represented as the mean of two independent experiments ± standard deviation. The outer membrane proteins of the carbapenem-resistant isolates were prepared and separated on SDS-PAGE. All isolates had intact outer membrane protein OmpK36. However, OmpK35 could not be detected among all tested isolates except isolate K40 which contained both porins OmpK35 and OmpK36 as shown in (Fig. 1). Fig. (1). Sodium dodecyl sulphate poly acrylamide gel electrophoresis (SDS-PAGE) of the outer membrane proteins OmpK35 and OmpK36 of the carbapenem resistant isolates compared to the standard K. pneumoniae ATCC33495. M: prestained protein marker; ST: Standard K. pneumoniae. In the present study, carbapenem-resistant isolates were categorized as three RAPD patterns named P1, P2 and P3. 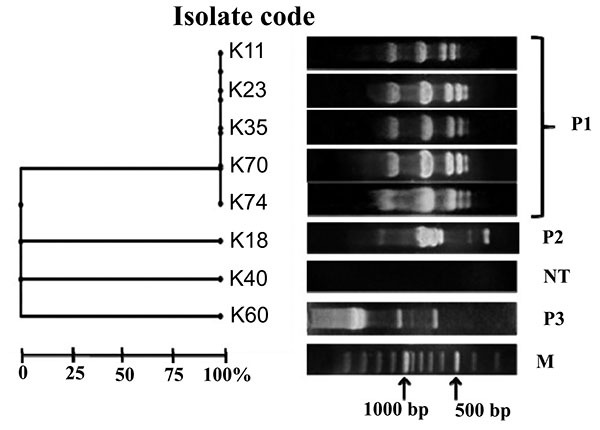 Five K. pneumoniae isolates K11, K23, K35, K70 and K74 shared the same pattern P1. Patterns P2 and P3 were represented by isolates K18 and K60, respectively. However, isolate K40 was non typeable (Fig. 2). Carbapenems have been kept as the last antibiotic choice for the treatment of severe infections, however, the development of carbapenem resistance significantly compromises their activities . Carbapenem resistance is widely spread all over the world and is becoming worrisome . Hence, characterization of the carbapenem-resistant isolates is the first step in the road map for controlling these isolates . In this study, eight isolates were found to be resistant to carbapenems as well as various classes of antimicrobial agents (Table 2). Similarly, carbapenem-resistant K. pneumoniae isolates exhibited coresistance to amoxicillin/clavulanic acid, ampicillin/sulbactam, cefuroxime and 3rd generation cephalosporins [13, 21]. The carbapenem-resistant isolates were classified into two groups according to the level of susceptibility to both imipenem and meropenem. The first group included isolates K11, K23, K35, K40, K60 and K74 with high resistance level to imipenem and meropenem (MIC≥16 µg/ml). The second group involved isolates K18 and K70 that were less resistant to both carbapenems (MICs from 4- 8 µg/ml) (Table 3). Fig. (2). Random Amplified Polymorphic DNA (RAPD) of K. pneumoniae isolates resistant to carbapenems. They assigned RAPD types P1, P2 and P3. The scale indicates similarity percentage. M lane represents the DNA marker (100 base pair plus). NT: non typeable. The carbapenem-resistant isolates were carbapenemase positive and harbored the carbapenemase encoding genes; blaNDM-1, blaVIM-1 and blaOXA-48 particularly, isolate K23 and K60 had multiple carbapenemases genes. These results revealed that class B carbapenemase are predominant in K. pneumoniae isolates assessed in this study. Various studies detected carbapenemase genes in the carbapenem-resistant K. pneumoniae isolates especially blaVIM and blaNDM however, carbapenemase blaIMP was not common in Enterobacteriaceae [9, 22, 23]. K. pneumoniae contained multiple metallo-β-lactamase genes have been previously detected in Germany , Italy , Colombia  and Sultanate of Oman . Additionally, both isolates K23 (blaNDM-1/blaVIM-1) and K60 (blaOXA-48/blaVIM-1) carried high copy number of carbapenemase genes (Table 3). Likewise, K. pneumoniae harbor multi-copies of blaTEM, blaCTX-M, and blaSHV  which conveys high resistance to β-lactams. Furthermore, multi-copies of blaNDM-1 were carried on pKPX-1 plasmid in the form of tandem repeats which contributed to high-level resistance to carbapenems in K. pneumoniae isolate KPX . On the other hand, both isolates K18 and K70 were less resistant to imipenem and meropenem, and contained low copy numbers of blaNDM-1. Hence, carbapenem resistance in these isolates could be attributed to other mechanisms. Loss of OmpK35 or OmpK36 porins has been associated with resistance to carbapenems and cephalosporins [13, 29]. Therefore, we examined the porins as an additional resistance mechanism. Kitchel, and coauthors  have detected that the lack of functional OmpK35 was prominent among 80% of K. pneumoniae isolates and only four isolates with low-level carbapenem resistance had mutation in OmpK36 sequences. On the same instance, our SDS-PAGE indicated intact OmpK36 in all carbapenem-resistant isolates and all isolates lost OmpK35 except isolate K40. Hence, the high carbapenem resistance could be attributed to multi-copies of carbapenemases and lack of OmpK35 (Fig. 1) as combined mechanisms of carbapenem resistance. Intermediate level of resistance to carbapenems in isolates K18 and K70 may be due to the loss of the OmpK35. On the other hand, isolate K40 with high-resistance level contained intact porins, and its resistance pattern can be attributed to the high copy number of blaNDM-1 (Table 3). Epidemiological classification of the carbapenem resistant isolates assigned three patterns P1, P2 and P3. Pattern P1 was the most predominant one where it displayed the profile of five K. pneumoniae isolates with 100% similarity. In the P1 profile, three isolates contained blaNDM-1 (K23, K70 and K74) and three isolates harbored blaVIM-1 (K11, K23 and K35) Fig. (2). This illustrated a possible genetic similarity between isolates encoding both blaVIM-1 and blaNDM-1. In the present research, K. pneumoniae isolates were resistant to carbapenems and to several antibiotics. MHT and PCR confirmed the presence of carbapenemases and multiple-carbapenemases in the isolates. Moreover, this study highlighted the prevalence of multi-copies of blaNDM-1 and blaVIM-1 in K. pneumoniae isolates with high-resistance levels. Loss of OmpK35 also assisted in carbapenem resistance to certain extent. The situation is worrisome as the available treatment options are limited and the development of novel molecules to control this invasive infection is not easily accomplished. Hence, more restrictions on the administration of carbapenems should be applied in our hospitals to reduce the spread of the carbapenem-resistant K. pneumoniae isolates. Huang YT, Hsueh PR. Antimicrobial drug resistance in Taiwan. Int J Antimicrob Agents 2008; 32: S174-8. Pitout JD. Infections with extended-spectrum beta-lactamase-producing Enterobacteriaceae: changing epidemiology and drug treatment choices. Drugs 2010; 70: 313-33. Nordmann P, Naas T, Poirel L. Global spread of carbapenemase-producing Enterobacteriaceae. Emerg Infect Dis 2011; 17: 1791-8. Gupta N, Limbago BM, Patel JB, Kallen AJ. Carbapenem-resistant Enterobacteriaceae: epidemiology and prevention. Clin Infect Dis 2011; 53: 60-7. Lee C-R, Lee JH, Park KS, Kim YB, Jeong BC, Lee SH. Global dissemination of carbapenemase-producing Klebsiella pneumoniae: epidemiology, genetic context, treatment options, and detection methods. Front Microbiol 2016; 7: 895. Pournaras S, Kristo I, Vrioni G, Ikonomidis A, Poulou A, Petropoulou D, et al. Characteristics of meropenem heteroresistance in Klebsiella pneumoniae carbapenemase (KPC)-producing clinical isolates of K. pneumoniae. J Clin Microbiol 2010; 48: 2601-4. Yigit H, Queenan AM, Anderson GJ, Domenech-Sanchez A, Biddle JW, Steward CD, et al. Novel carbapenem-hydrolyzing beta-lactamase, KPC-1, from a carbapenem-resistant strain of Klebsiella pneumoniae. Antimicrob Agents Chemother 2001; 45: 1151-61. Yong D, Toleman MA, Giske CG, Cho HS, Sundman K, Lee K, et al. Characterization of a new metallo-beta-lactamase gene, bla(NDM-1), and a novel erythromycin esterase gene carried on a unique genetic structure in Klebsiella pneumoniae sequence type 14 from India. Antimicrob Agents Chemother 2009; 53: 5046-54. Poirel L, Héritier C, Tolün V, Nordmann P. Emergence of oxacillinase-mediated resistance to imipenem in Klebsiella pneumoniae. Antimicrob Agents Chemother 2004; 48: 15-22. Walther-Rasmussen J, Høiby N. OXA-type carbapenemases. J Antimicrob Chemother 2006; 57(3): 373-83. Kaczmarek FM, Dib-Hajj F, Shang W, Gootz TD. High-level carbapenem resistance in a Klebsiella pneumoniae clinical isolate is due to the combination of blaACT-1 b-lactamase production, porin OmpK35/36 insertional inactivation, and down-regulation of the phosphate transport porin PhoE. Antimicrob Agents Chemother 2006; 50: 3396-406. Wang XD, Cai JC, Zhou HW, Zhang R, Chen GX. Reduced susceptibility to carbapenems in Klebsiella pneumoniae clinical isolates associated with plasmid-mediated beta-lactamase production and OmpK36 porin deficiency. J Med Microbiol 2009; 58: 1196-202. Shi W, Li K, Ji Y, Jiang Q, Wang Y, Shi M, et al. Carbapenem and cefoxitin resistance of Klebsiella pneumoniae strains associated with porin OmpK36 loss and DHA-1 β-lactamase production. Braz J Microbiol 2013; 44: 435-42. Tsai YK, Liou CH, Fung CP, Lin JC, Siu LK. Single or in combination antimicrobial resistance mechanisms of Klebsiella pneumoniae contribute to varied susceptibility to different carbapenems. PLoS One 2013; 8: e79640. Vandepitte J, Verhaegen J, Engbaek K, Rohner P, Piot P, Heuck CC. Basic laboratory procedures in clinical bacteriology, 2edn. Geneva: World Health organization 2003. Performance standards for antimicrobial susceptibility testing: twenty-fifth informational supplement, M100-S25. Wayne, PA, USA: CLSI 2015; Vol. 33. Heid CA, Stevens J, Livak KJ, Williams PM. Real time quantitative PCR. Genome Res 1996; 6: 986-94. Kitchel B, Rasheed JK, Endimiani A, Hujer AM, Anderson KF, Bonomo RA, et al. Genetic factors associated with elevated carbapenem resistance in KPC-producing Klebsiella pneumoniae. Antimicrob Agents Chemother 2010; 54: 4201-7. Hernández-Allés S, Albertí S, Alvarez D, Doménech-Sánchez A, Martínez-Martínez L, Gil J, et al. Porin expression in clinical isolates of Klebsiella pneumoniae. Microbiology 1999; 145: 673-9. Pimenta-Rodrigues MV, Fusco-Almeida AM, Bertoni BW, Pietro RC. Assessment of genetic relationship between Klebsiella pneumoniae and Klebsiella oxytoca samples isolated from a dental office. J Venom Anim Toxins Incl Trop Dis 2008; 14: 703-18. Steinmann J, Kaase M, Gatermann S, Popp W, Steinmann E, Damman M, et al. Outbreak due to a Klebsiella pneumoniae strain harbouring KPC-2 and VIM-1 in a German university hospital, July 2010 to January 2011. Euro Surveill 2011; 16: 19944. Sahin K, Tekin A, Ozdas S, Akin D, Yapislar H, Dilek AR, et al. Evaluation of carbapenem resistance using phenotypic and genotypic techniques in Enterobacteriaceae isolates. Ann Clin Microbiol Antimicrob 2015; 14: 44. Nordmann P, Poirel L. The difficult-to-control spread of carbapenemase producers among Enterobacteriaceae worldwide. Clin Microbiol Infect 2014; 20: 821-30. Perilli M, Bottoni C, Grimaldi A, Segatore B, Celenza G, Mariani M, et al. Carbapenem-resistant Klebsiella pneumoniae harbouring blaKPC-3 and blaVIM-2 from central Italy. Diagn Microbiol Infect Dis 2013; 75: 218-21. Rojas LJ, Mojica MF, Blanco VM, Correa A, Montealegre MC, De La Cadena E, et al. Emergence of Klebsiella pneumoniae coharboring KPC and VIM carbapenemases in Colombia. Antimicrob Agents Chemother 2013; 57: 1101-2. Dortet L, Poirel L, Al Yaqoubi F, Nordmann P. NDM-1, OXA-48 and OXA-181 carbapenemase-producing Enterobacteriaceae in Sultanate of Oman. Clin Microbiol Infect 2012; 18: 144-8. Marti E, Jofre J, Balcazar JL. Prevalence of antibiotic resistance genes and bacterial community composition in a river influenced by a wastewater treatment plant. PLoS One 2013; 8: e78906. Huang TW, Chen TL, Chen YT, Lauderdale TL, Liao TL, Lee YT, et al. Copy number change of the NDM-1 sequence in a multidrug-resistant Klebsiella pneumoniae clinical isolate. PLoS One 2013; 8: e62774. Sugawara E, Kojima S, Nikaido H. Klebsiella pneumoniae major porins OmpK35 and OmpK36 allow more efficient diffusion of β-Lactams than their Escherichia coli homologs OmpF and OmpC. J Bacteriol 2016; 4(23): 3200-8.